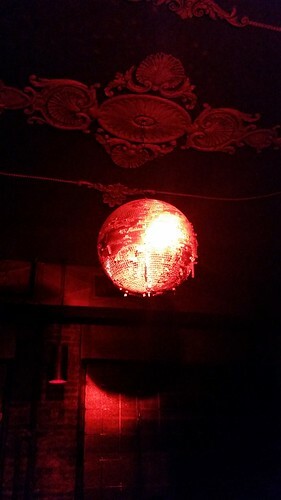 Last Saturday after our Bedford + Bowery Bazaar, we followed one of the event’s DJs, Nancy Whang of LCD Soundsystem and The Juan Maclean, to the former home of Europa, where she was spinning at the club’s first preview party. The place’s operators and handlers are still keeping it very much under wraps, but (oops!) a tweet from one of Saturday’s other DJs, “trans superstar of tomorrow” Nomi Ruiz, reveals that veteran club maestro Steve Lewis designed the room, which is actually three rooms located up a flight of stairs. The first consists of a spacious dance floor surrounded by curved banquette seating. That room is outfitted with a bumping sound system that can be heard half a block away, plus the obligatory state-of-the-art lighting, smoke machines and disco ball. It opens onto another room dominated by a projecting rectangular bar. And off to the side is a smaller parlor where, behind the DJ booth, a wall of shelves stocked with vinyl give off a library vibe. On Saturday, techno and electronica dominated the main room while New Order and the like had people pogoing in the side room. With the exception of a grimy, tattered disco ball in the library, the old Europa’s new look is about what you’d expect from the guy who designed Marquee and Butter — it feels a little like the backdrop of a Saturday Night Live monologue. But the initial programming is promising. The “previews” (the club was charging for drinks Saturday — $9 for a Jameson and Coke) continue this week with a Halloween party hosted by Greenpoint tattoo shop Three Kings and what’s sure to be a solid Dia de Los Muertos fete thrown by Burning Man-esque roving art partiers The Junxion (the folks with the psychedelic school buses). Other party hosts and DJs this week include underground rave and record producer Sean Glass (the guy from the East Village bathhouse parties), actor/performance artist Michael Cavadias, Modernluv (featuring Ghostly DJ and producer Moderna), and more. It’s uncertain what Good Room’s door policy will be, but the Halloween party, which starts at 11 p.m., is $10 with RSVP. More info at the club’s website. ?? outfitted with a bumping sound system that can be heard half a block away?? Hey creeps, this is a residential neighborhood, not the waterfront.